Sergio Ruzzier's inimitably quirky, dreamlike illustrations accompany the tender story of a mailman who yearns to get a letter himself. The illustrator of Eve Bunting’s Tweak Tweak and Have You Seen My New Blue Socks? makes his Clarion debut as author/illustrator with a tender book about loneliness and friendship. Leo, a mailman, takes in a small bird, Cheep, who missed the autumn migration of his flock.When spring comes and Cheep moves on, Leo is sad to see him go, but he also has hope, and the letter he has been longing for finally arrives. 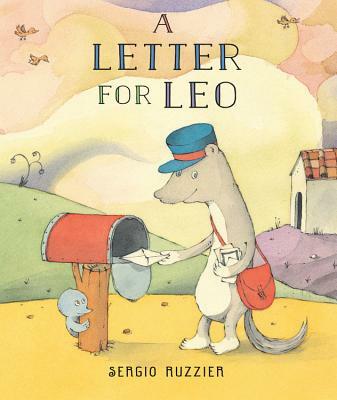 Sergio Ruzzier’s signature, slightly surreal animal characters and the setting, rendered in brilliant colors, make this simple, eloquent story a visual treat for the very young. "Friends separated by a move may be soothed by the (albiet old-fashioned) idea that they can stay in touch via letters"
"This is a lovely story about concision, reticence, and just the right balance of bitter and sweet." "Words and pictures combine to make a very satisfying story overall for young children and their caregivers." "A sweet, understated story set amid a wonderfully odd landscape." "Ruzzier writes with a thoughtful simplicity, and the story, thematically similar to Dubuc’s The Lion and the Bird, provides a useful connection point for kids who might relate to the sad feeling of being separated from a loved friend or family member. "